Its that time a year again for the fall seasonal beers to come out, that means Oktoberfest beer and Pumpkin beer. 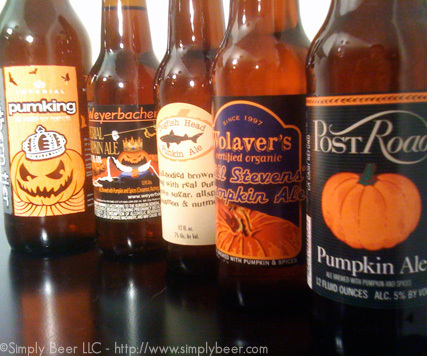 Pumpkin beer is technically a Spiced orVegetable beer, but can have a wide variety of flavors because of the base beer and spices that are included. Tonight’s recording will start around 7pm, if any one wants to virtually drink with us. I hope I’m not going to be sick of pumpkin after these pumpkin beers! So far this year I’ve had the Post Road and Punkin’ and I’m looking for more. Almost picked up the Wolaver’s yesterday, but I decided to hold off. Looking forward to your comments on these beers! I picked up a year old Weyerbacher imperial Pumpkin last monday. It had been sitting on the shelf for a year. Not a HINT of pumkin, or sweet malt. The thing had gone completely sour in a year….there was a funky A1 Steak sauce flavor. I am assuming the beer was flawed…look forward to seeing your review! Yeah…In all seriousness, I told my wife it would have pared well with red meat.